We announce the beginning of public beta testing of new application - Store Manager for CubeCart. Store Manager for CubeCart was developed to helps merchants manage their online stores, enhance functionality of default admin web interface, automate routine tasks and simplify day-to-day operations. It doesn't require any special knowledge to run, thus, store owner can concentrate on his basic business tasks. Now all CubeCart store owners can download free beta version of software from the official website and try it in action. 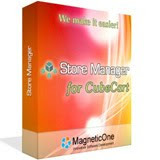 Besides, we invite you to help us test the application and improve Store Manager for CubeCart functionality. Join our Feedback Forum, submit the bugs found and feature requests, and get rewarded for your efforts.